A proximal humerus fracture is when the top part of the upper arm bone, which is shaped like a ball, is broken. It may also be referred to as a shoulder fracture. These fractures can be classified by where the break is, how many pieces it has broken into, and whether the broken pieces have moved out of place or not. The most common cause of proximal humerus fractures is a fall particularly when falling onto an outstretched hand. High speed motor vehicle accidents are another common cause. In most cases a proximal humerus fracture doed not require surgical intervention but is instead treated with a period of immobilisation in a sling and a rehabilitation programme. Here we will look at the different types of proximal humerus fractures, the common causes, treatment options and the recovery process including possible complications. The humerus is the long bone in the upper arm that sits between the shoulder and the elbow, and the top part of it is referred to as the proximal humerus. The four rotator cuff muscles, the main muscles responsible for shoulder stability and mobility, all attach here. 5) Surgical Neck: The surgical neck runs horizontally, just below the greater and lesser tubercles at the bottom of the humeral head. Most proximal humerus fractures occur at the surgical neck. 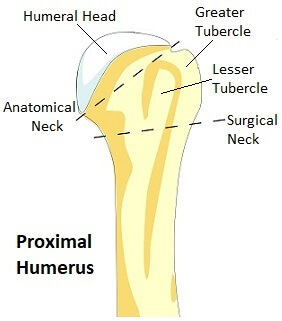 A proximal humerus fracture is typically categorised using the Neer System which looks at the number of fracture “parts” and the level of “displacement” of these parts. Neer divides the proximal humerus into four “parts”; the anatomical neck, the greater tuberosity, the lesser tuberosity and the surgical neck. He then looks at the level of displacement of the parts. If there is more than 1cm of separation or the angulation is greater than 45 degrees of a part, it is considered a displaced fracture. The Neer system can be seem slightly confusing initially as all fractures lines in a particular “part” are counted as one rather than counting the individual fracture lines/segments. This means there may be multiple fracture lines in one of the “parts” but that it is still only classified as a fracture of one-part. A one-part proximal humerus fracture is where there is no displacement. Any one or more of the four parts may be fractured, but there is less than 1cm separation and less than 45 degree angulation. For example there could be a fracture of the surgical neck and the greater tuberosity, but as long as neither of the parts are displaced, it is still classed as a one part fracture. Two part fractures are where one part is displaced more than 1cm or rotated more than 45 degrees. Again, there may be multiple fractures in multiple parts, but only one part is displaced here. 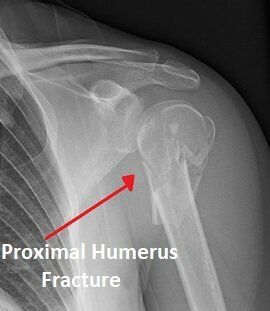 Approximately 20% of proximal humerus fractures are two part fractures. Three part fractures are where two parts are displaced. There will most likely be displacement of the surgical neck and one of the tuberosities (most commonly the greater tubercle), while the other tuberosity remains attached. Approximately 5% are three part fractures. This is where all four parts are fractured with three of them displaced in relation to the fourth. Four part fractures are a rare (less than 1%) but severe injury and almost always requires surgery. This is when as the shoulder is dislocated, meaning it has come out of its socket, as well as fractured. A proximal humerus fracture dislocation may be a two, three or four part fracture. Pain: The pain will be instant, severe and ongoing. You will certainly know you’ve done it! If you doctor suspects a proximal humerus fracture, you will be sent for various scans to evaluate the break. Usually x-rays from different angles of the shoulder and upper arm are sufficient for diagnosing and categorising a humerus fracture. X-rays are usually taken in three perpendicular planes, from the front (true AP view), the side (lateral scapula Y view) and through the armpit (axillary view). In some cases, you may also be sent for a CT or MRI scan if the x-rays aren’t clear. If the greater tuberosity is fractured then an ultrasound scan will be performed to check for rotator cuff muscle damage. 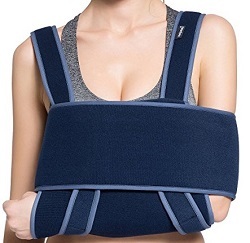 For the first few weeks after a proximal humerus fracture, a sling is worn to hold the fracture still and to allow the swelling and pain to subside. Typically, a shoulder immobiliser or sling and swath are used. These support the elbow and forearm and counteract the weight of the arm. The extra strap around the body helps to keep the upper arm immobilised. In some cases, a collar and cuff is used instead. They provide less support but allow the weight of the arm to provide gentle traction which can help improve the alignment of the fracture. Medication to relieve pain and inflammation will be prescribed by your doctor such as NSAIDS – non-steroidal anti-inflammatories e.g. ibuprofen or naproxen. If you have an open fracture you will also be given antibiotics to reduce the risk of infection. For the first couple of weeks after a proximal humerus fracture the shoulder should be immobilised in the sling, but it is important to do elbow, wrist and hand exercises to prevent any stiffness or weakness. Usually you can take your arm out of the sling to do these. They should be started as soon as possible and be done at least four times a day. It is important to move the elbow, wrist and fingers through their full range of motion to prevent stiffness and hand grips and balls are a great way to maintain strength. After 10-14 days, you should be able to start gentle exercises to get the shoulder moving. A physiotherapist will work on a rehab programme with you. 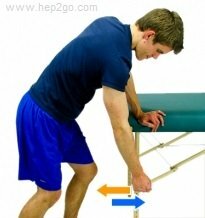 Pendulum exercises are the best place to start for regaining mobility. These are exercises where you use gravity to move the arm so the muscles don’t have to do anything, so they don’t pull on the fracture site. After around three weeks you can start active assisted exercises where you use your good arm or a bar/stick to support and move the broken arm. You may also be given a pulley system to use. In terms strengthening, you will start with isometric exercises. These are exercises where you push against resistance but without moving the arm so you don’t aggravate the fracture site. You may be allowed to start these as soon as pain allows or you may need to wait until the fracture has fully healed – check with your doctor or physical therapist. After approximately six to nine weeks the fracture should have united and you can move on to active mobility exercises and progressive strengthening exercises including resistance band exercises to regain rotator cuff strength. Rehabilitation will continue until you have regained full movement, strength and stability in the shoulder and elbow. You may need to keep doing exercises for up to a year to achieve this. Not everyone does regain full range of movement after a proximal humerus fracture and some people will have ongoing difficulty lifting their arm above head height. It is essential to rigorously follow your rehabilitation programme and do exercises daily to ensure you regain as much range of motion, flexibility and strength as possible. Failure to do so will lead to reduced shoulder movement which will likely affect function. Your doctor will see you regularly and x-ray the shoulder periodically to check on the healing process. Everyone heals at different rates so follow the guidance of your doctor or physical therapist as to when you can progress to the next stage of rehab. Around 15% of proximal humerus fractures are displaced and require surgery. In most cases, metalwork is used to realign and fix the bones. This is a temporary measure to hold things together to allow the bone time to heal, it is not intended to be a permanent support structure. The metal work may be removed at a later date if it comes loose or causes any problems. If the bone fails to unite, then further surgery will be required. There are a few different types of surgery for a proximal humerus fracture depending on the type of fracture and the individual’s functional needs. A closed reduction is where a proximal humerus fracture is realigned under anaesthetic without having to open up the shoulder with a scalpel. This may be all that is need, but if the realignment proves to be unstable, then the surgeon may use percutaneous pins or K-wires to hold the bone in position. They are inserted through the skin and into the bone at various angles to hold the fracture still. In some cases, the ends of the pins or K-wires are left slightly exposed so they can easily be removed once callus formation has begun, however there is a risk of infection and pin migration, so buried pins may be used instead. ORIF stands for open reduction internal fixation and is where the fracture is fixed using a metal plate and screws. An incision is made at the front or side of the shoulder. If there is any displacement, then the fracture is reduced (realigned). 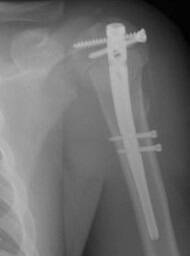 A metal plate is then inserted and held in place by surgical screws above and below the fracture site to keep it stable. The incision is then closed with staples or sutures. An ORIF is most commonly done on younger patients for two, three or four part fractures or when there is displacement of the greater tuberosity. A small anterolateral (front, side) incision is made through the skin and underlying soft tissues. A rod-shaped nail is then inserted into the hollow centre of the humerus bone, known as the medullary canal and held in place with surgical screws. This splints the fracture from the inside to hold it steady. Intramedullary nails are most commonly used for a two part or three part proximal humerus fracture, or if there is also damage to the humeral shaft below. 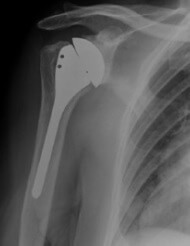 A shoulder hemiarthroplasty, aka partial shoulder replacement, involves removing the humeral head and replacing it with a metal implant. The stem of the implant is inserted into the medullary canal (the hollow middle of the upper arm bone) and will either be wedged tightly in place or secured with special cement. The ball is then attached to the top of the stem. 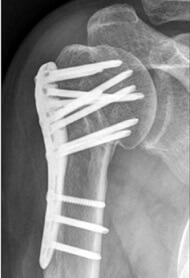 A shoulder hemiarthroplasty is usually done where the fracture is particularly complex or if other treatment methods have failed. There may be an anatomical neck fracture, a four-part fracture, a fracture dislocation, or the rotator cuff may have also been damaged. If the blood supply to the humeral head has been compromised and there is a high risk of osteonecrosis (where the bone dies), then a hemiarthroplasty is usually the treatment of choice. 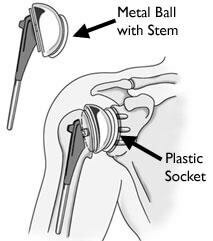 A total shoulder arthroplasty is where both parts of the shoulder joint are replaced. 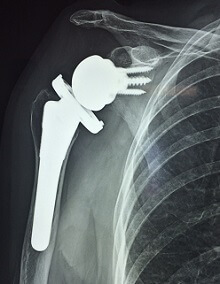 The ball-shaped humeral head is removed and replaced with a metal implant. The implant is shaped like a half moon and has a stem which runs down the middle of the humerus bone. The socket part of the joint on the shoulder blade is shaved down and a plastic socket is positioned and held in place with special cement. Shoulder replacement will be done if there is damage to the shoulder blade socket (the glenoid) alongside the proximal humerus fracture. The glenoid may have been damaged at the time of injury or there may be significant arthritis (degeneration) in the joint that would make a partial shoulder replacement unsuitable. The rotator cuff must be intact for a total shoulder arthroplasty otherwise there is a high risk of loosening of the prosthesis. Approximately 93% of total shoulder replacements last at least 10 years. If the rotator cuff has been damaged (partially torn or completely ruptured) with the proximal humerus fracture, then a reverse shoulder replacement may be carried out. It is most suitable for people over the age of 70 who have low functional demands. The deltoid muscle of the shoulder must be in good working order. In a reverse shoulder replacement, the ball part of the implant is placed on the shoulder blade and the socket is placed on the humerus, the opposite way round to normal, hence the name! That may sound like a strange thing to do, but what it does is allow the deltoid muscle to make up for the deficiency in the rotator cuff to allow greater shoulder movement than would otherwise be possible. The rehabilitation and recovery process from a proximal humerus fracture is basically the same whether treated with or without surgery. The most important part of the recovery process is regaining range of movement. Exercises: Strengthening exercises (starting with isometric strengthening then moving on to strengthening exercises with arm movement and the resistance) and continuing with progressive mobility exercises until full range and strength are achieved. Research has shown that smoking (or using nicotine products) delays bone healing and can increase the risk of non-union by around 6 times. Nicotine restricts the size of blood vessels by around 25% which means the bone gets less of the oxygen and nutrients it needs to heal, which can significant slowdown the healing process. Decreased Shoulder Function: full strength and mobility may never be achieved after a proximal humerus fracture, particularly in elderly patients or those who do not follow their exercise programme. Improvement is usually seen for up to one year after injury/surgery. 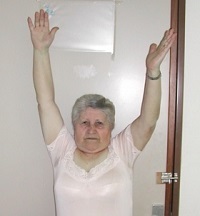 Frozen Shoulder: This is when the shoulder joint capsule thickens and tightens which can really limit shoulder movement. This typically happens when the shoulder is immobilised for a long period. Starting an exercise programme as early as possible helps to reduce the risk of developing a frozen shoulder, aka adhesive capsulitis. You can find out all about the condition in the frozen shoulder section. Avascular Necrosis: A proximal humerus fracture can disturb the blood supply to the humeral head resulting in avascular necrosis aka osteonecrosis. This is when there is bone cell death due to the reduced blood supply. The humeral head gradually collapses resulting in pain and reduced movement. Blood flow to the humeral head comes from vessels that branch off the axillary artery and travel upwards from the armpit region. Anatomical neck fractures and four part fractures are the most likely to impede blood flow and cause avascular necrosis. Proximal humerus fractures are just one type of shoulder injury - you can find out more in the shoulder fractures section. If you are looking for exercises to do following a proximal shoulder fracture, whether you need surgery or not, visit the shoulder exercises section.